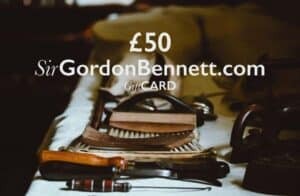 When you buy from Sir Gordon Bennett we want you to feel like you are also making the right choice for the environment too. We believe that everyone should do their bit to cut their footprint in Britain. We want to keep this green and pleasant land as green and pleasant as possible. To do our bit, all of our packaging is thought through to make as small an impact as possible. Our boxes come from 80% recycled material and 20% wood from sustainable sources, that are FSC approved. And would encourage you to re-use our boxes if at all possible; like sending Auntie Trixie her birthday present in it. We have also thought long and hard about void filling, one of the main culprits when it comes to non-essential packaging. We hate poly peanuts and plastic air bags, so use British Wool from Blue Faced Leicester sheep. Not only is it environmentally friendly but is great for British sheep famers. After enough orders from Sir Gordon Bennett you may even have enough wool to knit a pair of socks.